At the dawn of the Internet age (1996), conceptual poet and performer Kenneth Goldsmith created UbuWeb, an online archive that has become, as he writes, the “definitive source for all things avant-garde on the internet.” An initial interest in visual and concrete poetry expanded to include sound and music, film, and literature. Archival formats changed as technology evolved from early scans to audio streaming to a current repository of over 2,500 full length films and videos with over 7,000 artists represented. On today’s UbuWeb, editors oversee collections from specific disciplines, universities donate bandwidth, and Goldsmith and his allies continue to fend off accusations of copyright infringement. Fifteen years later, UbuWeb maintains its fiercely independent, generous, yet precarious spirit. 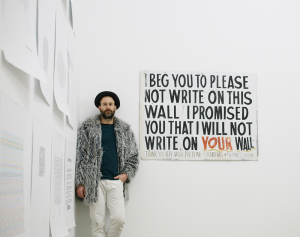 Join us for an evening with Kenneth Goldsmith as he performs his poetry and looks back on the history of UbuWeb, offering us a glimpse of its treasures.